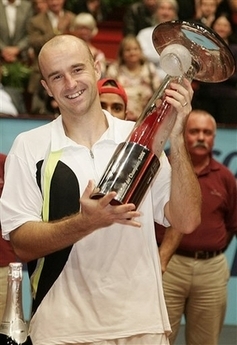 Ljubicic wins Vienna title Email Print Normal font Large font October 16, 2006 - 2:16PM Top seed Ivan Ljubicic won his third title of the year by beating fifth seed Fernando Gonzalez of Chile 6-3 6-4 7-5 in the Vienna Open final today. The lanky Croatian, who added to his championships in Chennai and Zagreb, is the first player since Roger Federer in 2002 and 2003 to successfully defend the title "It's great to (successfully) defend a title. It's the first time in my life," said Ljubicic. "And I defended the biggest title I have, so it's great." Ljubicic was also runner-up this year in Miami and Bangkok and stands third in the race for a spot in the eight-player field at the season-ending Masters Cup in Shanghai. He is the second player this year to win a title without dropping serve after Mark Philippoussis who won in Newport. He also did not drop his serve in winning the 2005 title. Ljubicic, who claimed the sixth title of his career, also came close to maintaining his remarkable record of not even facing a break point during his run to the two titles. He conceded just one point on serve in the first set and only one point in each of his five service games in the second. His record ended, however, when Gonzalez led 3-2 in the third set and earned four break points which Ljubicic survived. The Croatian played impeccable tennis in the opening set, and maintained such a high standard throughout the match that Gonzalez was never really in contention. It was only in the third set that Gonzalez came close to competing at the same level but he still had to fend off two break points at 1-1 before doing so. After failing to convert his four break points for a 4-2 lead, Gonzalez had to fight off three break points at 3-3. With the set seemingly headed for a tiebreak, Ljubicic broke for 6-5 when Gonzalez netted a forehand and then smashed his racquet in frustration. Ljubicic set up match point with three consecutive aces, and closed out the contest on his second match point. "It was pretty similar to last year's final," Ljubicic said. "The first set was one way definitely, the second was a little bit closer, and in the third set my intensity dropped and he felt it and tried to come back. "I kept the pressure on him and at five-all he just couldn't handle the pressure any more, and the last game was quite easy." Gonzalez admitted he had been outplayed. "I didn't play bad," said the Chilean. "But he serves unbelievable, especially indoors, and he was going for it every shot. Usually, when I play him and I play a baseline shot I feel I have an advantage against him, and today wasn't the case. "He was hitting the ball and I didn't know where to go, and in the first two sets he was winning his serve really easy. I had a chance in the third set but didn't take it, and it's tough because you don't have many chances against a player like him."